The Case of the Stinky Socks by Lewis B. Montgomery: Synopsis and Online Purchase Options. Synopsis (from the publisher): Milo and Jazz team up to solve their very first mystery! The Wildcats' star pitcher is missing his lucky socks, and his pitching is going to pieces. But who would have stolen a pair of stinky socks? The jealous team mascot? The super-smug tennis champ? A player from the rival team? 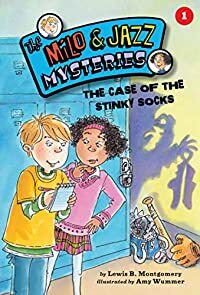 Milo and Jazz have to find the thief—and the socks—before the big game!